1. Please confirm if this was officially approved by LIF (as the “Jamats” constitutional “body”). b. He has numbered this No 267.
a.	when this is and will be a Diamond Jubilee Deedar (like Uganda and Tanzania recently). a. Can we please have a copy of this ? (which is “a Farman” as defined by Hazar Imam in Farmans. a. Can you please let us have a copy of this Farman, and a list of the Visits in and since Golden Jubilee in which Hazar Imam, not given Deedar But only conducted “Jamati Work “ meaning the usual religious rites and ceremonies (for only the Local Jamat). 8. LIF adds that there will be further Diamond Jubilee “Visits” . Meaning Diamond Jubilee Deedars to other parts of Canada and other countries. a. If not please confirm there will be no Deedars at all. Please share a copy with all LIF Members and all the National Councils and Mukhi’s and Kamadia Sahebans for their Jamats. Any response, feedback or information from anyone is welcome. It is in simple English. There have been pending jamati work visit of eastern Canada from last few year for majlis entry,BOL,MADHAM etc. So not a one cenrtrailzed jubilee darbar with fanfare. So a difference is made in articulating the message. For a country like India ,some project visit,inaugural ,etc is desired to secure invitation from the government as a STATE GUEST of the country with honors and not a private visit. So just a religious visit to grace his followers may not precisely qualify any to be state guest in secular country like India. Did you see the honor at both Dar and Kampala airports.? You have raised a petty issue,trying to make mountain out of a mole. Read the words.MHI has authorized ,this has been added that many blinkered think LIF announcements sans any authority of MHI and it a fancy of their own making. SO I SIDE WITH LIF as their notional attorney general of ALI. but in the case of TKN data( 7 miilon energetic jamat) utility and scope ,I will tear them apart with the same Zulfiqar( now keyboard) of ALI and inspiration of ALI. So let us ALL celebrate in our home town along with eastern Canada in SPIRIT of ONE JAMAT. ( spirit does not means not physical). SAMOSA ,BIRYANI,SHERBET, JALSA AUR KHUB JALSA. To mehboobchatur: Ya Ali Madad. In regard to this wordings. Can you please let us have a copy of this Farman, and a list of the Visits in and since Golden Jubilee in which Hazar Imam, not given Deedar But only conducted “Jamati Work “ meaning the usual religious rites and ceremonies (for only the Local ond Jubilee “Visit. I attended the didar on earlier day .On last day they were many Ismailis and I was outside to see MHI passing bye.So were a hundred odd jamat from other parts on India & abroad. The event was at Hasnabad.Some senior volunteer came outside and took those from outside Mumbai and abroad inside the compound gate. There was cub & bul bul salutation to happen after didar ,which was outside Didar hall and compound gates.MHI was there full 03 minutes and also Gave blessing in louder voice chord to those standing there. I do not know whether it was a discreet decision of local leader or call in heart of the volunteers which made outstation jamat to get few minutes of deedar and not few seconds. What I saw from outside compounded gate. May be it was a minor act of indiscipline but local leaders and/or the volunteer were sensitive to the utmost desire & wish of out station Ismailis outside on roads on the last day.THAT is precisely the spirit of one jamat.in the first place ,the outstation jamat should not have been there.Leaders have to maintain dicilpline and also sensitive to unwarranted visitors,balancing that is very tough.They did it beautifully here. A jubilee or a Didar is an occasion to show Generosity towards the "One Jamat", an expression used by the Imam of the Ismailis. However there is no "One Jamat". There is local jamat, there is outsiders jamat, there is international jamat etc.. all this divisions are made by some leaders, not by the Jamat or the Imam. It is understandable that only locals are given time for these religious work. However if there is a general Didar, why not let the travellers come in also? About 500 people from outside the region will probably make the trip with desire to see the Imam either at airport or other venues. Do we have any president or Mukhi with the Generosity towards those "outsiders", will they mention their presence and ask Imam if they can attend? Lets see if rules apply only to some or to all. President Talib is from Western Canada. Will he make a point to abstain from coming to Eastern Canada and ensure that his family and friends also do not attend in Eastern Canada? Doubtful... Will his kith and keen only attend one Didar? Doubtful. What about the family and friends of LIF people? tough question? The Jamat knows the answers from what happened in East Africa. This said, this section is for information, please keep it this way and stop the controversies. No amount of controversies will be able to give a heart and a soul to those who are born without one and no amount of controversies will be able to remove the heart and soul of those who are born with one. To Admin: YA ALI MADAD. Is the president of Canada the president of only western Canada or whole of Canada? Mhi is coming to Canada. As his position ,he should be there at all major events airport ,etc. He may not be a likely a participant of an MHI activity strictly meant for regional jamat. But MHI at times personally grant them to be in didar hall. THERE ARE SOULS THAT ARE BLESSED TO NEAR ALI. let ALI take a call on that ,who are we to protest and make noise about it.? Lets keep the controversies out. Talib will have his Mahadan in Vancouver and his Mehmani also there and he may seek his BK also in Vancouver. We will be happy for him. He can also arrange the same for his family and friends and the family and friends of the LIF people who flocked by the dozens inside the Didar Hall in East Africa while all of the other "under-rated" Ismailis where in the street..
Seeking and having Deedar is the ultimate, and foundational parts of "Prayers", and the Ismaili muslim faith , as is seeking, reading, understanding Famans, which include Ginans, and making them integral part of every murids daily life. Red=grading this next Diamond Jubilee Deedar. This will be the fourth Diamond Jubilee religious visit (Deedar*), by Hazar Imam for all Ismaili murids, believers (pilgrims**), Two were in Uganda & Tanzania earlier this month. The first one was on 11 July 2017. That was also a Deedar where those there were representing the Jamats. Ya Mawla we pray you accept our humble pledges and submissions. Mawla for those who may not know, is another name used for Imam of the time, as are many others, such as Sat Gur, Shah, Hazar Imam, Khudavand, Bapa, Yali Bapa, Pir, Sat Gur, Mawla, Sami, Noor Mawlana, Ya Shah, Ya Ali, Shahebul Zaman, Dhani Salamat Datar, Awal, Akhir, Zahir, Batin, Noorun Allah Noor. Hahul Kayum, Hai Zinda, & Kayam Paya, Rahman, Rahim. (In Quran there are 99 names of Allah). All three words have words have didar is common ,so zahir didar is 1/3 of didar achievement, why not each murid strive for baatin and noorani didar,for that all the controversis for entry,travel influence pavement standing,,etc etc will not emerge. We are too much zahiri in our desire and school of thoughts. The next two didar is available thru effort of your ownself ,that quantam is 24 hours of didar at will. ours is Sufi,baatin tariqa of highest form of intellect. If we are stuck in zahiri perception of our faith ,there will petty postings and clash of ignorance. MAY ALI BLESS YOU WITH RUHANI ROSHNI. Ya Ali Madad, My understanding is that Deedar is when Hazar Imam blesses you with the manifestation of spiritual enlightenment from the Noor of Hazar Imam. This is a blessing given, not our right to have or command. You can "see" MHI physically many times, but that is not Deedar until you are blessed with deedar. If you are not that does mean you have failed. There is no failure. Your success is in your effort (BUK Farmans). Therefore you must continue to seek Deedar. That is what we pray for and seek every day in our daily prayers. There is no difference in a “Deedar” when Hazar Imam blesses you with spiritual enlightenment, which is a manifestation from the Noor of Hazar Imam. Deedar can be a blessing in the presence of Hazar Imam at a Padramni, Mulakat, Darbar, or on the street etc. Deedar can also be a blessing in the physical absence of Hazar Imam at any time, any where including especially in JK & during submission in Bayat ul Khayal. My understanding is from reading of Farmans (including Bayat ul Khayal Farmans). We must not mock anyone, and always be respectful and respect differences. That is also what MHI and Quran says we must. Thank you for your understanding and that your basic desire is Zahiri Deedar which is 1/3rd, and then Batini Deedar 1/3rd, and then your ultimate desire is the ultimate 1/3rd which is Noorani Deedar. Nuseri is shrouded in a cocoon of ignorance and should remain there instead of venturing outside of it and making such highly judgmental and yet irrelevant statements. I say irrelevant because the debate here centers around the celebration of our beloved Imam's Diamond Jubilee. Who would not want to be part of such a monumental occasion? Those who could, went - with a lot of hope and enthusiasm. But they were barred from participating in such a once-in-a-lifetime event. That was just plain cruelty, period. That is the main focus of the debate: wanting to be a part of a historic occasion. Even those who practice Baitul Khayal regularly and are advanced in their search would not wish to miss out on such an occasion. Therefore this renders Nuseri's argument as totally irrelevant. Also, kindly stop using degrading words such as "globetrotters". These are murids of the Imam. They love Him and they go to see Him whenever and wherever they can incurring great financial expense as well as enduring physical duress, not forgetting the vitriol of our leaders and their squad of security henchmen. I would feel they should be admired and respected, not scorned, ridiculed and belittled. It is the love for the Imam that pulls them just as a moth is drawn to a flame. Nobody has the right to judge them. When a murid sees his or her Imam physically nobody can actually know what is transpiring between that murid and the Imam. And so, people like Nuseri should just retreat into their cocoons of ignorance and stay there. Love for the Imam has infinite expressions and seeking a physical glimpse of the Imam, seeking to participate in His occasions of happiness, cheering Him on and supporting His projects, are as important as obeying His farmans and seeking and searching for His true spiritual identity through Baitul Khayal. I dare anyone to contradict this statement. Among the Ismailis, there are also some followers of the Imam. If a follower can not follow his Imam, who do you want him to follow? The Wizard of Oz? Are we Murids of the Wizard of Oz or of the Imam? This is a special year, it is a year of Generosity. So far the question remains: Is this really a year of Generosity for all the Ismailis? The word Didar (beatific vision) comes from the Persian word didan, “to see”. Didar means “vision”, “sight”, or “glimpse”. The word Mulaqat comes from the Arabic word liqa – which means “face to face meeting”. The word liqa appears throughout the Qur’an, referring to the “Day of Meeting” (Qur'an 9:77, 84:6, 29:5, 6:154, 18:110, 32:14, 41:54, 30: that takes place when human beings will have the direct vision of God on the Day of Judgment. The Qur’an also says that a preview or foretaste of the Meeting (liqa) with God takes place in the physical world when human beings behold the Signs of the Day of Meeting (Qur'an 13:2, 39:71, 10:7, 6:130). In this respect, the Imam is the living Sign of God and the murid’s vision of the Imam – called Liqa or Didar – is a foretaste and preview of human soul’s eschatological vision (liqa, didar) of God to take place in the hereafter. Whenever Mawlana Hazar Imam meets with the Ismaili Jamat in a Tariqah setting and designates this as a Didar, then this gathering is a Mulaqat (face to face meeting) and a Zahiri Didar (Exoteric Vision). 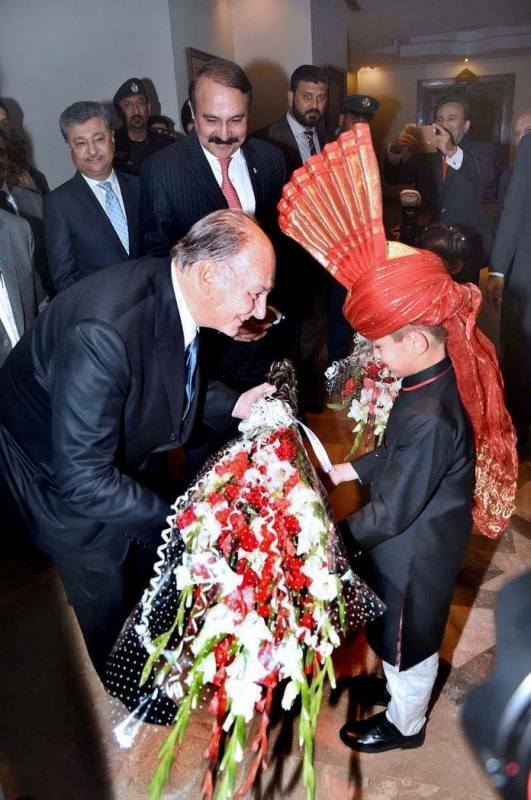 There are also occasions where the Mulaqat includes non-Ismaili Muslims and people of other faiths – such as in Syria and Tajikistan – in which case the occasion is still a Zahiri Didar for the Ismailis. Thus, a Mulaqat is any gathering – designated as such by the Imam – where the Zahiri Didar of the Imam takes place. Sometimes, on special occasions, Mawlana Hazar Imam ordains and declares that a Mulaqat of the Zahiri Didar will be a Darbar. Darbar is the Persian word for the Court of a King, referring to the chamber in which the King’s guests gather to have an audience with him. In contemporary times, when Mawlana Hazar Imam declares that a particular Mulaqat will be a Darbar, it means that the Mulaqat is an occasion of special happiness and special celebration. On several occasions such as his 1994 Darbar in London and his 1998 Darbar in Lisbon, Mawlana Hazar Imam explained that he was ordaining that the gathering be a Darbar because of a special occasion – such as the announcement about the Ismaili Centre in Lisbon. Throughout the Golden Jubilee Year, almost every Mulaqat of the Imam with the Imam was declared as a Golden Jubilee Darbar. During the Golden Jubilee Darbars, Mawlana Hazar Imam was in a very jovial mood and often cracked multiple jokes in his Farmans to cheers of applause and laughter from the Jamat. Every Darbar is a Mulaqat and a Didar; but not every Mulaqat and Didar is a Darbar. One key difference between a normal Mulaqat and a Darbar is that the Imam wears his traditional robe ( jabbo) and astrakhan cap inside the Darbar. Meanwhile, in non-Darbar Mulaqats, the Imam tends to wear his suit and wears another kind of robe on top of it. In a certain respect, the Fatimid Court and other places where the Ismaili Fatimid Imam-Caliph gave audiences to his subjects could be called a Darbar. In this setting, the Imam sat or rode out in the front and centre of the area; important Fatimid dignitaries would salute the Imam with a special greeting and pay homage to him; Qur’anic verses and other oaths of loyalty were presented before him. The Imam was dressed in a special turban and robes, accompanied by a parasol bearer and other dignitaries. Sometimes the Imam would also grant special robes of honour to certain officers for their services. For example, one source describes how the Fatimid Imam-Caliph al-Zahir “rode in procession with is troops, wearing a “round” robe of dabiqi linen with gold threads and a matching turban, seated under a parasol with gold threads” (Sanders, Ritual, Politics, and the City in Fatimid Cairo, 64). The volunteers did the most fantastic job. Upon leaving HI would not close the door of the car, so the president called the HQ MKs and HI talked to them for a while and when they came back to the hall, they said that HI gave special dua Ashish to all the volunteers for a wonderful arrangement. Mawla had always had great expectations from the Jamat. He even expressed it the very first time He came to Canada and said that He will look to the Canadian Jamat to help and assist the global Jamat. Time to fulfill Mawla's wishes. Sent by someone : YAM, mowla bapa was extremely happy. He blessed our volunteers for their work and appreciated all their efforts. He said the young should enjoy their lives and the wise should share their wisdom. He said at least 3 times that we should share our knowledge with the jamats around the world because we are one jamat. We should extend our brotherhood. He kept saying that if we go back to those countries then he will be 'very very very very' happy. He said he was very happy this afternoon then he paused and said 'wait no morning' then he checked his watch and laughed and said 'yes morning' he went to sit down then the mukhisaheb said something to him and he got up again and joked, he said 'my mukhis have to always remind me what to say if i forget something' he gave us blessings again. He went to sit the third time and was almost about to sit when mukhi told him something again and he laughed and went to the mike and laughed he said 'mukhi said it's time for me to leave' he gave us blessings again and left. The entire jamat was laughing and was so happy. Well it was an epiphanic Didar experience!! More later!! The intezaar program was excellent and Alwaez Karim Gulamali was the MC for all the Quranic recitations, ginans, qasidas Zikr tasbihs and he delivered most or all of the short waezes himself. I thought he was outstanding and now have a newfound respect and admiration for him. One point that sticks out in my mind is that this was not a Darbar, where Hazar Imam does the inviting to celebrate and be happy; this was a Mehmani where we issued the invite: we invited him into our own homes! I thought that was brilliant!! And then he said everything flows from our personal invite to the Imam to enter our homes through the front door and asked us to think about what would like him to do for us. That set the tone for the Mulaqat and all the recitations reflected what we wanted, needed and wanted to receive from him by his grace. I’m just going to free-associate and say whatever comes into my mind that impacted me. The entire congregation shed tears as the video of his Audi sports car coupe(4-door) came into the building and stopped on the red carpet. Mowla’s Canadian security agent got out of the front door, opened up Mowla’s rear door and offered him a helping hand to exit the vehicle. When you see old men and women nearing the end of their lives start crying unashamedly you know you are in the presence of indescribable Greatness!!!! am: Mubaraki to you all on Hazir Imam’s mulaqat and jamati work in Eastern Canada. Yasmin and I had coat check duty at Metro Toronto Convention Centre today and were not supposed to be partake to the jamati mulaqat. Our mulaqat (Scarborough jk) is scheduled tomorrow morning. Volunteers from jk’s scheduled for mulaqat today went in at 8:30 and we continued to fill in for them in coat check (as planned). At 10:30 after reciting zikr tasbih with the volunteers outside the mulaqat hall, we were suddenly called to go to the mulaqat hall where they momentarily opened the doors for us to join the rest of the jamat for deedar. We had an amazing surprise deedar. Hazir Imam looked very worried, was serious, no jokes and made a very strong firman. Mubaraki to you again and inshallah Mowlana Hazir Imam will schedule similar visits to Western Canada early in 2018. Ameen. 2017-11-18, 6:47:16 PM: N. K: Hey fam. We just got back from the mulaqat. What a wonderful event. 1) the volunteers did a phenomenal job. It was so well organized. From the second we got into the metro centre downtown everything was seamless. 2) The hall was perfect size, everyone was respectful and disciplined, and you could feel the power of the salwats when recited together. It was spiritual to be in there as one Jamat. 3. The intezar program went from 3:00 to 5:30. HH arrived by car at around 5:35 and entered the hall by 5:40. Sabs, Natasha, Faisal and I sat centre back and as he came in he walked right by, which was cool. He didn't stop smiling and acknowledging the Jamat as he walked the hall. 4. He sat down, and three separate ginans / prayers were recited by three groups, then MKs from each of the Jamats offered the mehmani. Then HH stood to say a firman which lasted 20 minutes. It was different type of emotion.. pure bliss and appreciation of the moment. You could just feel it.. We did. Key takeaways: 1) he emphasized "peace" for his Jamat globally as his primary goal. 2) he talked about happiness and that nothing makes him happier than to see his Jamat smile. He did not once stop smiling. 3) he talked to the youth specifically. And this really stuck with me and forever will. Told us that we are highly educated but to continue educating. He then said something that was resonating: "the world is competitive. Very competitive." That things are changing and we need to "stay ahead of the curve. That's what they call it in this part of the world. Ahead of the curve. (With laughter).You must stay ahead and continue educating".. then he said an incredible statement: "I want to you to win. That's what I want from my you, to win". 4) he then talked about volunteering and that with everything we have, our capabilities and knowledge, that he wants to see us apply it in other areas where Jamat live where they are struggling in their civil societies. That is what he very much wants from us. He wants us to spend time abroad and teach others elsewhere and that is the responsibility we now have 5) he talked about collaborating within the community and working together instead of separately. 6) he mentioned strengthening the institutions globally and that with the right infrastructure, institutions, education, and collaboration that we can bring peace. Again, he talked about peace non stop. 7 ) he then finished the firman with a heartfelt prayer. Talked about families, accentuated the prayer to our families, that he "wishes for nothing but happiness, baraqat, good health, more happiness, and peace, lots of peace". He then sat down, came back again and gave one more prayer for families and jokes. Went back, to the chair and came back with laughter and said "the mukhi just asked a (can't remember the word) question, "is this your last mulaqat"? With laughter from everyone. "There will never be a last mulaqat. I am always with you.". Kanavadan. And then walked out. Smiling. First of all lots of Mubarakis to you all for the most wonderful Deedar we had this morning. Mawla was extremely happy and in a very humorous mood. I understand that this morning was the largest gathering of this visit - they announced it at 10K. We had volunteer duties and got there at 4:50am this morning. After registering in with volunteer check-in and done light refreshments we were posted for our duties. I had duty inside the Mulaqqat hall and they opened the doors at 6:40am. The Jamat entered the hall in an orderly & disciplined manner. The crowd was relatively small to start off & people trickled in at a very manageable & steady pace and by 9:45am the hall was full & practically everyone had arrived. The program started with pre-intezaar program at 8:00am till about 9:15, when the intezaar program started. The intezaar program had much more intensity, both in the selection of items recited and the caliber of the reciters. Followed by Zikr tasbih. Then followed presentation of mehmanis by MKs for each Jamatkhana. Mawla then got up to address the gathering with His Firman. His Duashish was for the murids present there & their families, wherever they may be living in the world. So Mubarakis to you all as He particularly addressed His blessings to all of us. He was in an extremely humorous mood and started by making the Jamat laugh a loud. He started by saying ‘This afternoon..’ & then corrected by saying ‘I think it is morning’ & lifted his wrist to look at His watch & said ‘let me check that it is still morning .. yes it is morning’ He laughed loudly and the Jamat laughed loudly with Him. He then proceeded with the Firman & the message was that the Canadian Jamat is fortunate that Canada strongly upholds the principles of plurality & urged the Jamat to spread the understanding of pluralism to other parts of the world, particularly where pluralism is absent. He said that the Canadian Jamat should share their knowledge with the rest of the world. He mentioned that the Canadian Jamat is made up murids originating from 7 different countries & as such they must help their brothers & sisters in other parts of the world. He talked about the concept of global brotherhood and that we should help our Jamats all over the world until no murid is left desperate & in difficulties. He, as always, commended the volunteers for the wonderful arrangements & give His duashish. In His duas to the Jamat He, amongst the usual duas, He said I give blessings to students to be successful in their education, I give blessings to the young to enjoy life & blessings to the wise to share their wisdom & we have many, many wise men & women in our Jamat - share your wisdom. When Mawla went back to His chair, Mukhisaheb said something to Him & He came back to the mic & said - My Mukhi/Kamadias always remind me when I forget something & then proceeded to give duashish for individual mehmanis. Once again when he was about to sit on His chair He had conversation with Mukhisaheb & came back on the mic & said My Mukhi/Kamadias have said I am free to go if I want to. He blessed us all again & then proceeded to walk out & this time he walked down the middle & turned towards the runner on the other sides& walked there, stopping at murids who were on hospital beds. Once He left, Mukhi/Kamadia came back with special message of blessings for the Jamat. Mawla was with us for about 45 minutes, which felt like less than 5 minutes. Once again Mubarakis to all of you. You all were in our hearts, thoughts & prayers & when He mentioned your families wherever in the world they may be living, we all felt that He included you all in His duashish. The Ontario jamat’s discipline; the jamat’s active participation in the intezari program and the high standard of recitations, the work of the leadership and volunteers have all contributed to making the Ontario visit spectacular. There are other anecdotes that describe the intense interaction of the Jamat with the Imam as he walked around to shower his Noorani rain and blessings on the jamat. More testimonies describing Murids' experience during the Eastern Canada visit. At about 6:10 PM, Mawlana Hazar Imam entered the Deedar Hall, three hours after we had entered, settled, and sat in Intezaar. His face shining with Noor, he entered from the back of the room, went towards the right side of hall, contoured his way around to the front, and finally sat down. In the meantime the Jamat was reciting Salwat in such unity never seen before. He finally sat down, and the Salwat came to an end. After the traditional recitation of Tilawat, Qasida, and Ginan, Mukhi Saheb along with Kamadia Saheb garlanded Hazar Imam with a beaded bracelet, representing the infinite rope of Imamat. Turn by turn, different Mukhi Sahebs, Kamadia Sahebs, Mukhiani Sahebas, and Kamadiani Sahebas presented Hazar Imam with the Jamati Mehmani. Amongst those MK’s were our very own Campus Mukhida and Kamadianis, who got a back in the back from Mawla at the holding of the Mehmani plate. Hazar Imam then rose up to address His spiritual children. He started his Firman by greeting the Jamat, and specially greeting the Jamats’ family, whether they’re in Canada or anywhere around the world. He insisted to spreading his special greetings and blessings to his family as soon as possible. He then continued to talk about his Jubilee Year Initiative: Reducing poverty within the Jamat Worldwide. He shared his goal plan, and also mentioned it’s not just a one-year project which will end as the Jubilee year will come to a term, but rather a task that will continue well beyond the momentous year. He ended his Firman by appreciating, thanking, and specially blessing the volunteers who made this Mulaqat possible. He then proceeded to take a seat, to return just a few seconds later after having a brief conversation with the Ottawa Mukhi Saheb. He joked: “You see, the Mukhi Kamadias have the notes, while I don’t” and came back to reflect upon the Jamat’s laughter. He emphasized on the Jamat staying happy, and smiling, as nothing makes him happier than to see His spiritual children smile. And once again blessed the volunteers, and then the whole Jamat. He then went to regain his seat again, to come back up again, for the third time, after taking to Mukhi Saheb again. This time again joking, about getting Ottawa HQ Mukhi Saheb’s permission to leave, which he shall follow. As He descended his flight of stairs, the Jamat erupted in Salwat. He then juggled on the spot to choose what direction to leave through. He chose the opposite direction from which he came in, gracing the other side of the room with his closer presence. Shukhar, I happened to be sitting in that particular side of the room, on the edge of the red carpet, closer the exit. As he walked closer to the exit, the Salwat got louder and louder, and made sure, to make eye contact with each and every person sitting around him, leaving his Jamat in a puddle of tears. Alhamdulillah I happened to be one of those Murids to make eye contact with him, which got my already red eyes bust out even louder into tears of joy I’ve never cried before. Shukhar Mawla for such a memorable experience, and may he Grant a visit to as many countries as possible during this milestone year. Ameen. Yam: Mubaraki to you all on Hazir Imam’s mulaqat and jamati work in Eastern Canada. To all the registration team members from Mowla. "Mowla was very happy with the visit. Things went smoothly and it all starts with Registration. Don't be surprised if you get a call to share your best practices with the global jamat, and then ended with Prayers for Barakah!" Mubaraki. I am also sending this email to express my tremendous gratitude to you and your entire teams. You were called upon with short notices and you stepped up to the challenge. Through your leadership, you and your teams have shown compassion, professionalism & "class". The number of compliments I have received from both the Jamat & leadership has been heart-warming. It has been an absolute pleasure working with leads & teams that are dedicated & committed and have the best interest of the Jamat at heart, teams that worked tirelessly with patience & tolerance throughout all offsite locations. We were dealing with matters of Jamat's spirituality and you left no stone unturned in registering Murids thereby assisting with their spiritual journey and ensuring they all made it to ICT. I salute you all. Thank-you from the bottom of my heart. May Mawla grant you, your teams & all your families 1000-fold Barakah for this unique seva. Ameen. Please feel free to forward this email to your teams & families. Testimony of Farez, a Murid who is legally blind but came from Kenya with his special equipment (medical binoculars) to have a glimpse of Hazar Imam somewhere during the recent Canada Visit. His happiness for the Canada Jamat and much more. The testimony of Farez also contain clips of Mowlana Hazar Imam at the hotel. A Must see. How much inconsiderate people have been with him, even in public places. Incredible in a year of Diamond Jubilee which is supposed to be a year of generosity and care. Lets pray that Farez has a better treatment next time he comes to Canada and that he does not think that all Ismailis of Canada are the same. I attach a “shocking” video testimony & proof by Farez, who is handicapped. He is declared blind, and can see very little & only with a medical aid. I formally request you to discuss this with LIF, M Talib & M Eboo. I also request them to apologise unreservedly for their behaviour and for hurting this, and others Murids there. This is reprehensible & most shameful. I am happy to arrange a conference call. And LIF must not to treat visiting Murids at future Deedars, as they have in Canada ( & in Uganda, & Tanzania). If there is no acknowledgement and or an apology, I will write also to Hazar Imam. What does Canada think by using the above hashtags as their tag line for the recent padhramni? In 2011, during their Mulaqats for Jamati Work, Uganda, Tanzania and Kenya included an International Darbaar which were attended by the global jamat, including large numbers of Canadian Ismailis. Mowlana Hazar Imam was so happy about these international Darbaars. He even had new robes designed which He proudly wore during those Darbaars. In 2017, not a single murid from outside Eastern Canada was allowed to attend but what is painful is that not a single Canadian Ismaili murid stood up and asked or questioned the leaders as to why an International Darbaar was not being included as part of these Mulaqats. Not one Canadian Ismaili stood up and fought for their global brothers and sisters. So #OneJamat from where? And how? Even the few murids (less than 20) who came from outside Eastern Canada to catch glimpses of the Imam at His hotel were treated so badly by leaders and Ismaili volunteers alike! The testimony of the handicapped Farez Kanji speaks volumes. The leaders have ensured that our jamat is now completely divided into jurisdictions. And displaying such hashtags for the recent Mulaqats in Toronto and Montreal is nothing but a mockery. Mowlana Hazar Imam made the Montreal and Ottawa Jamats promise to convey His blessings to the Jamat that “was not there”. How marvelously benevolent our Mowla is! The leaders and the jamats on the other hand have been extremely selfish. So do away with this misnomer of a hashtag tagline since we cannot exemplify it!! Mukhi giving a list of prayers from the Jamat to the Imam, The Imam always accept request from the Mukhi Kamadias. Imam comes to give with open heart, he wants to give. But is the Jamat ready to take? Open your heart and open your doors to international Jamat. Remember a Happy Jamat makes a happy Imam. And a Happy Imam gives millions of Barakat to his Jamat. Sent as received : Family members experiences from didar in Yasin Ghizer Pakistan is so heart touching. 1. Imam arrived early than the scheduled time. 2. MHI was so Happy that stood up 3 times and blessed with so much prayers. 3. Spirituality was in peak even the Army security on duty were not able to raised their heads infront of Imam. Even heard that a person jumped in foots of Hazir Imam. 4. The themes of farman were ethics of Islam, brotherhood and good relations with other communities, importance of ECD, avoid usage of drugs. 5. At last MHI has made a light joke that i don't want to go but mukhi gave me permission to leave. First of all, I wish to greet my Ismaili brothers and sisters around the world mubaraki on the auspicious occasion of the magnificent Diamond Jubilee Darbar held in Aliabad, Hunza, on Sunday, December 10th, 2017. I was present at the Darbar and I am delighted to share with you my experiences at the Darbar, and I hope my friends who were present at the gathering will submit their feedback to expand on my piece. I humbly ask them and many others who were present at the Aliabad and Yasin Darbars in Gilgit-Baltistan as well as at the two Chitral Darbars in Booni and Garam Chashma to share their wonderful and inspiring accounts.